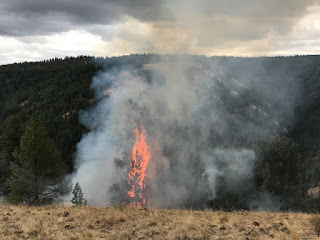 With the extended dry period and no rain, the Pomeroy Ranger District’s Dark Canyon Prescribed Burn is continuing to creep and smolder in steep timber stringers. 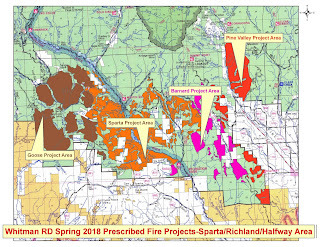 On Sept.11, District Fire and Fuels Management staff, with the assistance of Department of Natural Resources, Washington Department of Fish and Wildlife, and other agency employees, ignited a 1,750-acre prescribed fire. 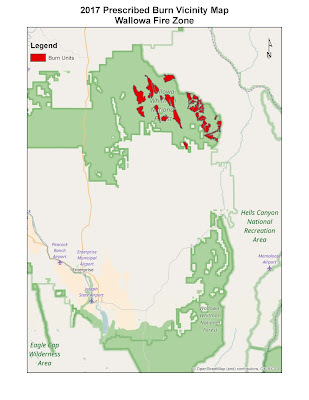 The objectives were to reduce down and ladder fuels components in steep timbered stringers and enhance big game habitat on both Forest Service and Washington Department of Fish and Wildlife Service lands. Night time higher relative humidities and lower temperatures have aided prescribed fire personnel in keeping everything under containment and within the prescription of the burn. 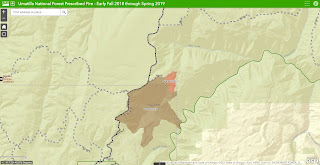 The prescribed burn did spot in a couple of areas outside the original prescribed burn boundary last weekend due to the lower humidities and higher temperatures. Fire personnel have been successful in catching and holding those spots, even in steep, rocky terrain. The Dark Canyon Prescribed Burn is continuing to burn in prescription and prescribed fire objectives are continuing to be met. With cooler weather and possible rains in the short term forecast, Forest visitors should start to see less and less smoke in the area. In an effort to help local concerned individuals interested in learning more about this land management practice, including opportunities to visit the prescribed burn area, Pomeroy Ranger District staff are available and encourage the public to contact Fuels Management Staff Tara Mackleit (509-843-4676) or District Ranger Monte Fujishin (509-843-4620).